After an enjoyable and closely fought contest Forth and Endrick won the Area 6 Bonspiel on 22 January - for only the third time since the tournament's inception in 1985. Their last victory was 1997/8. Forth and Endrick had 8 points and 22 ends, Stirlingshire had 6 points and 24 ends, West Lothian had 6 ends and 21 ends, Scottish Central had 4 points and 21 ends - their total affected by a no show from Callendar and Trossachs. The decisive game was in the second session when Buchlyvie narrowly beat Falkirk by 7 shots to 6, despite Falkirk losing a 5 at the second end. Had it gone to a peel then Stirlingshire would have won on ends won. Congratulations to Forth and Endrick . The winner of the Bonspiel trophy (to the highest up club in the winning Province) was Buccaneers. The Trophy and Prizes will be presented the the Area AGM. It all went very well as you can see from the gallery below. It was good sportsmanship to ensure the Swiss teams won in 3 of the 4 games to emphasise the social and friendly nature of the event. ‘Oldest’ Curling Province in the world celebrates 150 years. The 150th anniversary of what is believed to be the oldest curling Province in the World, Scottish Central Province, was celebrated by a Bonspiel at the Peak Ice Rink on 1 October, followed by a dinner at the Stirling Court Hotel (formerly the Management Centre) at Stirling University on 17 October. The Province was affiliated to the Royal Caledonian Curling Club in 1864 and there are currently 7 clubs - Airthrey Castle; Blair Drummond; Bridge of Allan; Callander & Trossachs; Doune; Dunblane and Keir – which have all been instituted for over 100 years. Doune (1732) is the oldest and Keir (1895) the youngest. Doune and Bridge of Allan were founder clubs in the Province; the others being Ardoch, Ardoch Junior, Auchterarder, Blackford, Dunblane Thistle and Sheriffmuir who no longer exist. 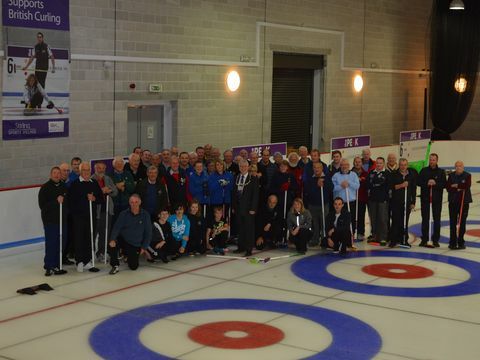 All the current clubs had teams playing in the Anniversary Bonspiel against clubs representing West Lothian Province, Stirlingshire Province, Forth and Endrick Province and Dunbartonshire Province as well as Stirling Young Curlers and Stirling Virtual Club. A total of 24 teams took part. A Civic Reception was held during the interval where Stirling Provost, Mike Robbins, came along to welcome the guests. Each participant was given a commemorative SCP 150th Anniversary Badge. The winning Province team (Keir 2) and the winning invited team (Stirling Virtual) were presented with their prizes at the Dinner attended by over 70 curlers and guests. RCCC President David Henderson proposed the toast to the Province, noting the centuries old tradition of curling in Scotland and congratulating the Province on its achievements. In reply, David McFarlane, President of the Province, gave a brief outline of the Province’s history and said there were many magnificent trophies associated with the Province which are still contested today. He welcomed the attendance of all Province clubs and clubs with whom the Province has had long standing associations and hoped these would continue. Guest speaker, Jane Brown, rounded off a memorable evening with hilarious tales from her involvement with speaking to Burn’s clubs across the world. Jane is immediate Past President of The Robert Burns World Federation and has visited Canada, Australia and Russia among other places, clocking up over 80,000 miles in the process. She also manages the Globe Inn in Dumfries which Burns frequented. The evening concluded with a raffle and presentation of bouquets to Jane Brown and the ladies who had helped with the organising of the event and to the office bearers, David McFarlane (President), Bill Strang (Secretary) and Graham Russell (Treasurer) who each received a personalised glass trophy for their part in making the anniversary such a success.